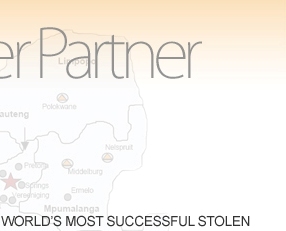 Tracker Retrieve is the world’s most successful stolen vehicle recovery device. It is an easy to use and cost-effective solution whereby you notify us if your vehicle has been stolen. With a simple phone call to Tracker’s 24-hour National Secure Operating Centre (0800 13 23 23), you set into action a chain of events which will more than likely result in the return of your stolen vehicle. Tracker Retrieve is approved by major insurers and motor manufacturers with capabilities in neighbouring countries such as Lesotho, Swaziland and Mozambique. A small tracking unit is fitted onto your vehicle by a highly trained member of the Tracker mobile installation team or at any of our fitment centres. Once activated by Tracker’s National Secure Operating Centre, the unit begins to transmit a signal which is received by our tracking units. If your car is stolen by an experienced car theft syndicate, it is likely that they will strip your vehicle as soon as possible, in search of the unit. This means, the sooner you contact us, the quicker we can activate your unit and the better our chance of recovering your vehicle.